The conclusion of my baseball travels… until next year. 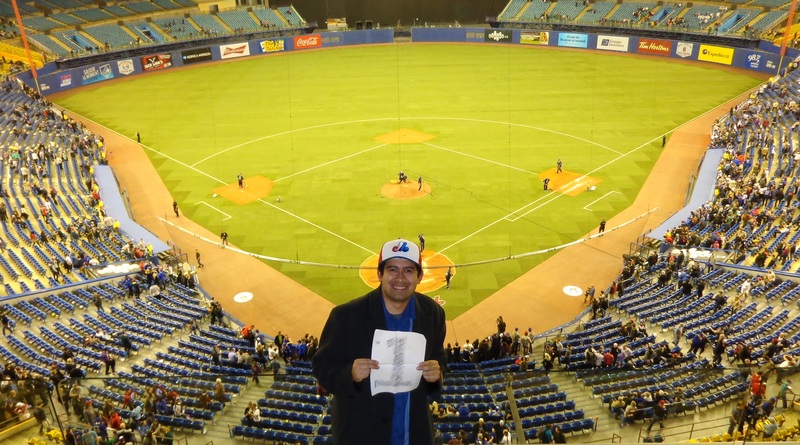 This will become an all-encompassing post about all the ballparks visited in the last three years, but this entire journey has been so incredible and I have met a plethora of fascinating fans from around the country… and Canada. 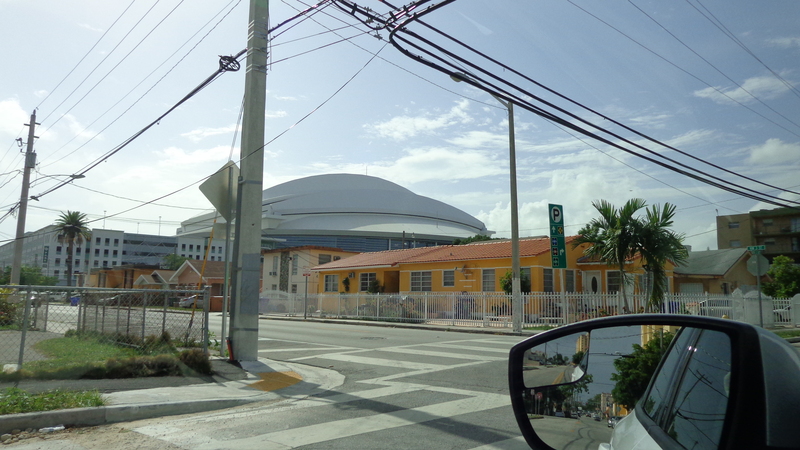 When I started traveling to a few stadiums in 2014, I had no intention of getting to all the stadiums. Well, that is to say, I had no intention at the time. When I made my initial trip to San Diego and Arizona, that’s when a couple friends of mine planted the seed in my head that I should start writing about my travels, at least for them to keep up with me! One of those friends works in the media, and his name is Taylor Blake Ward. You may have heard that name before, but he has worked at Angel Stadium for the past couple seasons. I cannot thank him enough for the support! Oh, that trip down to Miami. After getting dropped off at the bus terminal in St. Pete, the Sun was shining and it was a lovely day. Then the rains came… again. This was becoming a very common theme throughout this southeast portion of my travels. Without going into too much detail, I was very delayed arriving because of the weather, and our bus driver getting lost in horrible Miami traffic because the Greyhound station had changed to a new location that week! Getting the rental car for this place wasn’t much better. After a very tough time getting around and finally getting to my hotel room (the first and only time I’d stay in a hotel during this leg of the trip), I was ready to rest and get ready for baseball the following day. 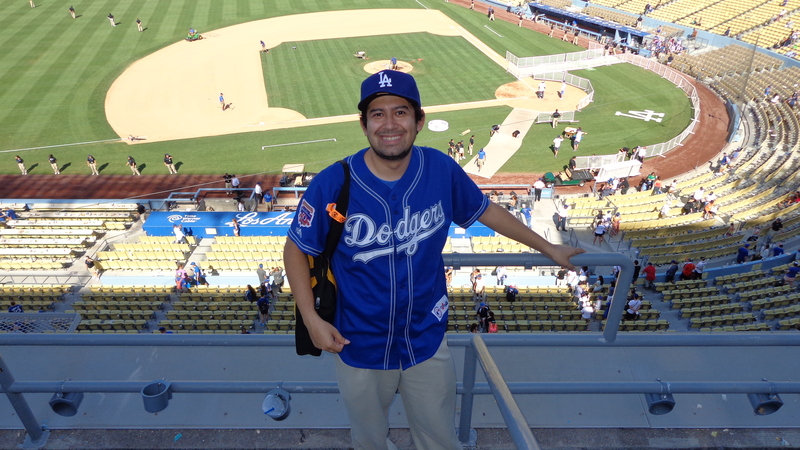 Even though I have been to Dodger Stadium more times than I can count, this game warrants a short and special blog post because of the meaning of this game. Plus, this would count towards my ballpark count for the season. In addition, my good friend, Paul (borsche28), took video during that day and it’s up on YouTube for you all to see. Check it out, it’s a really well-done video. The funny thing about writing a traveling baseball blog during the summer is the drama that can unfold over the course of a season. When I first began this journey, I didn’t expect to see the large amount of traveling Royals fans as I did in Arlington, Texas. I also didn’t expect to see some of the crazy baseball I saw in the month of September (and October), but more on that later! The ballpark: LoanMart Field, elevation 1190 feet. 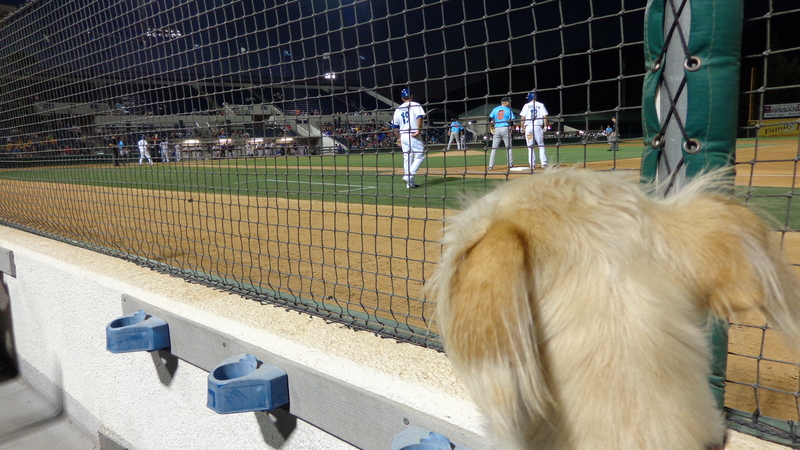 The game: 66ers @ Quakes on August 27, 2014. 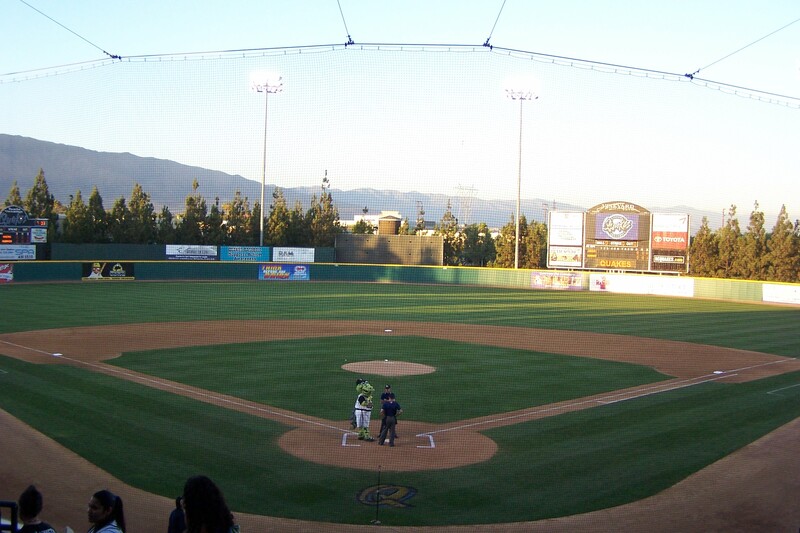 The Rancho Cucamonga Quakes are a high-A minor league team for the Los Angeles Dodgers. 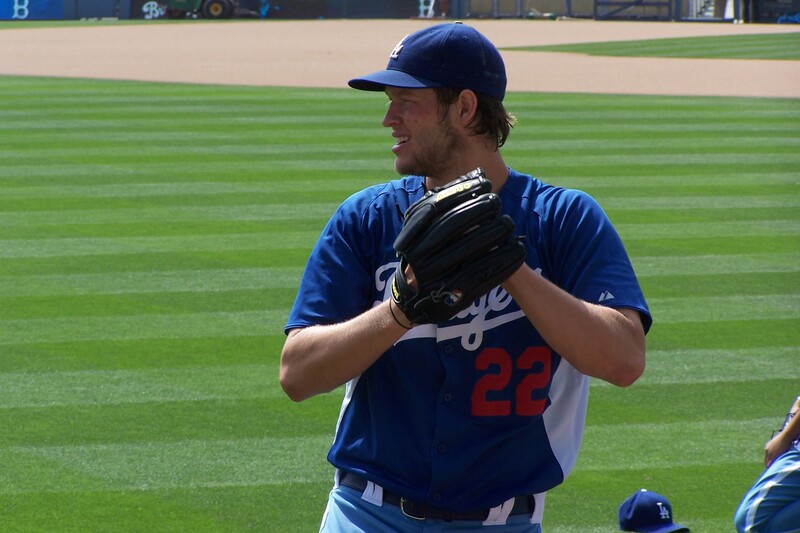 Earlier this season, Clayton Kershaw pitched a rehab game there, and all six thousand seats were filled. On this game, they were on the brink of being eliminated from the Cal League playoffs, and there was a decent crowd there. When this park was built in the early 1990s, the Quakes became the new team name. Because of that, the ballpark had one of the coolest names in the minor leagues: The Epicenter. Many folks around the ballpark still call it The Epicenter. Yes, this is a departure from my posts about my ballpark tour, but with the regular season ending yesterday, I thought I would put up this post regarding a hot topic in baseball right now. There have only been three pitchers to win the National League Most Valuable Player award since 1955. Why did I choose that year? That’s the year the Brooklyn Dodgers won their first championship, and their only title while still playing in Brooklyn. The last player to do it was Bob Gibson (St. Louis) in 1968. Before that, two dominant Dodger pitchers won the MVP: Sandy Koufax (1963) and Don Newcombe (1956). Many former players didn’t like facing those three previously mentioned pitchers. In fact, even HoF’ers like Maury Wills even said that they hated facing Bob Gibson because of the intimidation factor he presents. Fast forward to 2014, and we are hearing about several players saying the same thing about Clayton Kershaw. His twelve-to-six curveball – or “public enemy number one” according to Vin Scully – is a plus pitch in his arsenal that fools countless batters every game. Folks, I’m not going to beat around the bush, the Dodgers are my favorite team in the major leagues, and always have been. I couldn’t think of a better place to start my tour than my second home for over twenty years. I’ve been going to games there since I was six, and have seen many fantastic games and have attended some historic events there. One of my first baseball memories is getting to see Fernando Valenzuela pitch at the Ravine, and a very major memory for me took place in 1991 when the Montreal Expos’ Denny Martinez pitched a perfect game against my home team. I will honestly say that was the only time I openly rooted against the Dodgers at my home stadium because I wanted to see the perfect game happen. Needless to say, I have a love for this old stadium, but I will try to be as un-biased as possible for this particular trip. 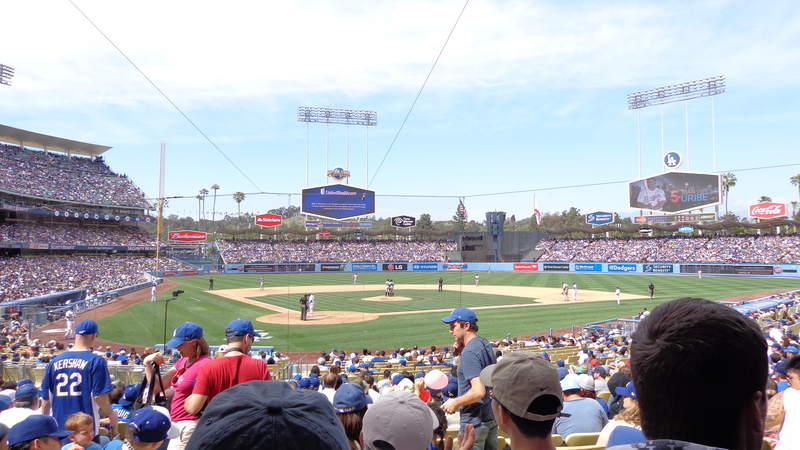 Ballpark 1: Dodger Stadium, elevation 502 feet. 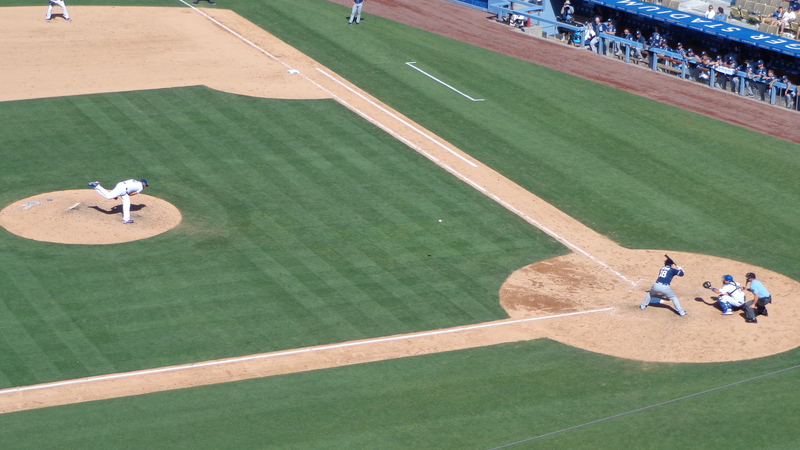 The game: Padres @ Dodgers on July 13, 2014. Arriving at Chavez Ravine was a breeze, and I wanted to arrive early not just for the free parking, but also for the awesome giveaway, which was a Dodgers portable speaker. It has already been put to good use. This is one plus about the Dodgers, especially under new ownership, the giveaways have been really good. Earlier in the season, I got a replica Don Newcombe #53 Brooklyn Dodgers jersey as the free giveaway, so you can see that the quality of giveaways are quite excellent. The new HD DodgerVision jumbotrons! As I arrived, the first thing I did was snag a couple Dodger Dogs and make my way to my seat… which was still in sunlight. Fortunately, these are Dodger fans coming to the games, so I was able to move to shade easily, but more on the fans later. As I mentioned before, the food prices have risen this season, but there is also more variety. 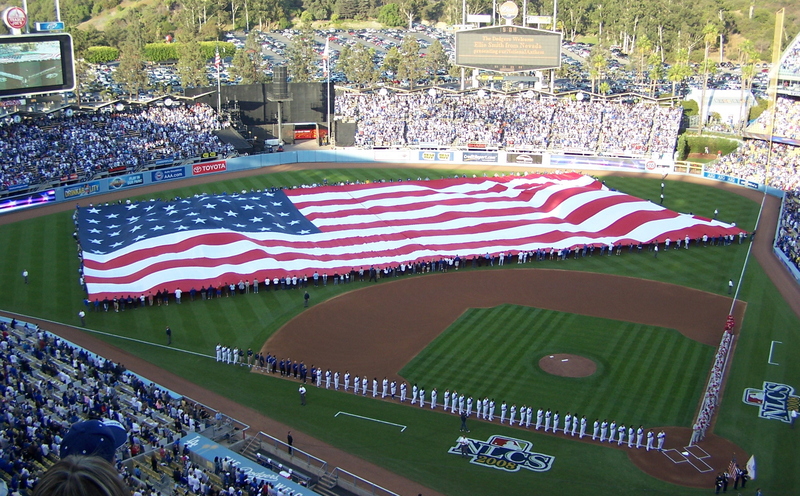 The main sell for everybody is the world-famous Dodger Dog, now $5.50! Even worse, the Super Dodger Dog is now over $7 (That used to be $5.50). Now there are Mexican “Doyer Dogs” sold that includes Pico de Gallo on it, burgers, garlic fries, Italian “Brooklyn style” pizza, and even the locally-famous Cool-A-Coo ice cream sandwiches, which are excellent, if you ask me. Ticket prices: While regular ticket prices for the Los Angeles Dodgers are not too shabby, this is definitely a place where the secondary market consistently has incredible deals on tickets, and this is mainly due to the fact that there are a plethora of season ticket holders that end up selling their tickets at a decent price. For this particular game, ticket prices were well below face value. My ticket was a lower-row seat in Inner Reserve, section 19, for only $8.49 after the awesome Wendy’s discount. Yep, I got a good seat for under ten bucks! But for most Dodgers games that don’t have an extremely popular giveaway, ticket prices on StubHub are beyond cheap, so your best bet is to look there for most games. For parking (or lack thereof) and the ticket, I only spent $8.49. With the two Dodger Dogs and a drink, I only spent about $25 for the whole game! The fans: The stereotype is true that fans typically “arrive in the 3rd inning, and leave in the 7th inning.” However, because my seat was drenched in sunlight and many of the seats above me had not arrived yet, I quickly moved up to the last row of that section and kept fairly cool in the shade. Still, it is a sad fact that fans don’t show up early, and that gives Dodger fans a bad rap. I don’t think this has to do with a lack of support, and it didn’t sound like a lack of support based on what the people below me said. Apparently, there was some particularly nasty traffic on the I-5 freeway, a route I never take (nor would I recommend taking). This family had to deal with a couple bad accidents on their way to the Stadium, but that is something that could be easily avoided by taking better routes, or just simply avoid the same route everyone else goes. Better yet, your best bet is to ARRIVE EARLY. The game: Because of the blazing sun, I moved up to the empty top rows for the first four innings of the game (since they went so quickly), and then moved down to my original seat for the rest of the game. The Dodgers had a couple base-runners in the 2nd inning, but weren’t able to cash in a run. 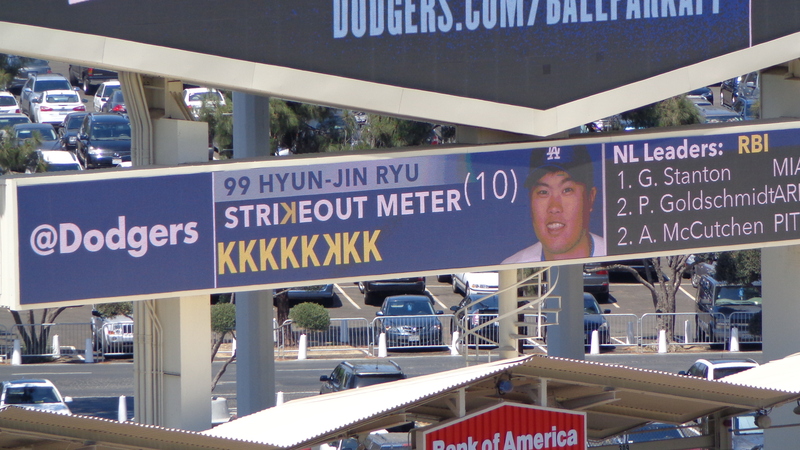 Ryu actually pitched a very solid game for the Dodgers only allowing two hits over six innings. All of his pitches were working, although he did make 20 pitches in the top of the 6th. The game was moving very quickly until the bottom of the 6th when All-Star Yasiel Puig scored fellow All-Star Dee Gordon on a solid RBI single. That was the only run scored of the game. The game came to a crawl when Dodgers manager, Don Mattingly decided to pull Ryu after six innings, and it nearly cost them the game. But, aside from that, this was a fairly routine win for the Dodgers who were in first place in the NL West at the All-Star break! It’s time to enjoy an East Coast thunderstorm as I continue writing. Next stop, San Diego. The next post will come tomorrow, Sunday evening! I know this post is coming a week late and a dollar short, but I wrote this out about a week ago, but never had the time to finish the post and put it up. This is how it was written a week ago. Enjoy! So with a soft autumn breeze in the air, the Dodgers were behind two games to none, and I was arriving at the stadium about four hours before the game. I wanted to get a good parking spot out on the streets, and decided to blast the Dodgers music I brought, and bring some sandwiches. It was fun for a little over an hour, and then my friend, Matt, and I decided to get in the stadium early to see what was going down. Unfortunately, there was no early entry for batting practice down in the field level, but it was good for my friend who had never met Sweet Lou Johnson before. He got that special treat in autograph alley. As soon as we got to the front of the line, he recognized me from the last time I was there at the stadium (I had been there for the one NLDS game, as well as the Dodgers’ home season finale when they won the NL West title). Of course, who could mistake a Mexican Dodger fan with an easily recognizable orange Wheel of Fortune bag? That’s besides the point. After saying hello to Sweet Lou, Matt finally got his autograph and a picture with the former Dodger. After taking some batting practice along the outfield warning track, we made our way to our seats and sat back with a Dodger Dog, a drink, and the pregame ceremonies beginning shortly. It was nice to just sit back and watch all of this as the afternoon came to a slow and beautiful close. The player introductions of the whole team was awesome, but there is nothing quite like seeing that enormous American flag waving in the outfield with the national anthem being sung so well. Yes, it was great last time in the division series… but this was with the sun setting on the third base side, and a bit of that golden sun shining on the flag. Moreso, this was the National League Championship Series! 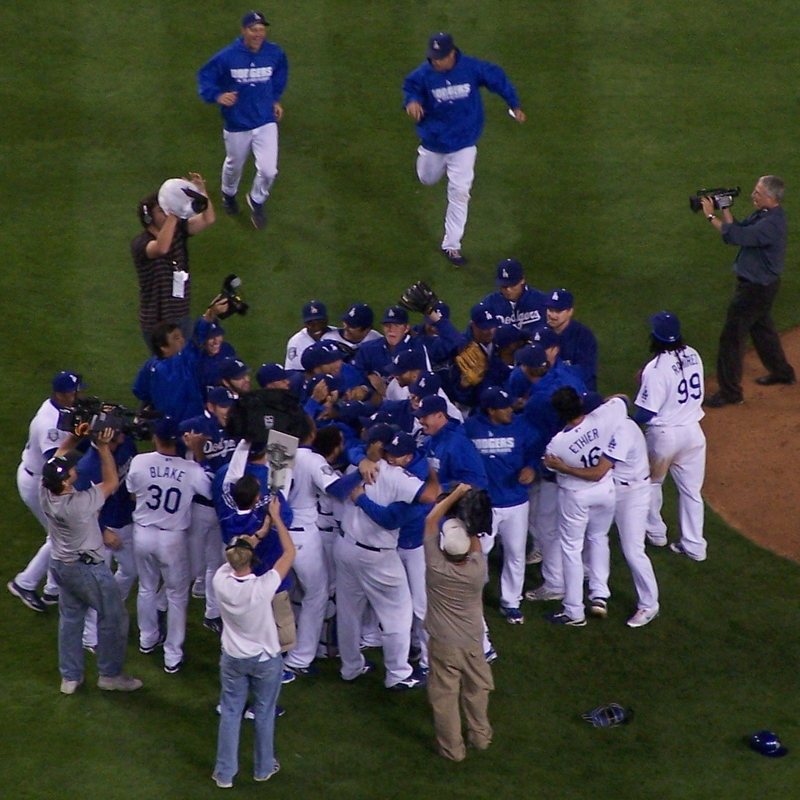 It was the first time the Dodgers had seen the NLCS in twenty years, the feelings were pretty overwhelming. One of the best parts of the pregame festivities was the first pitches. 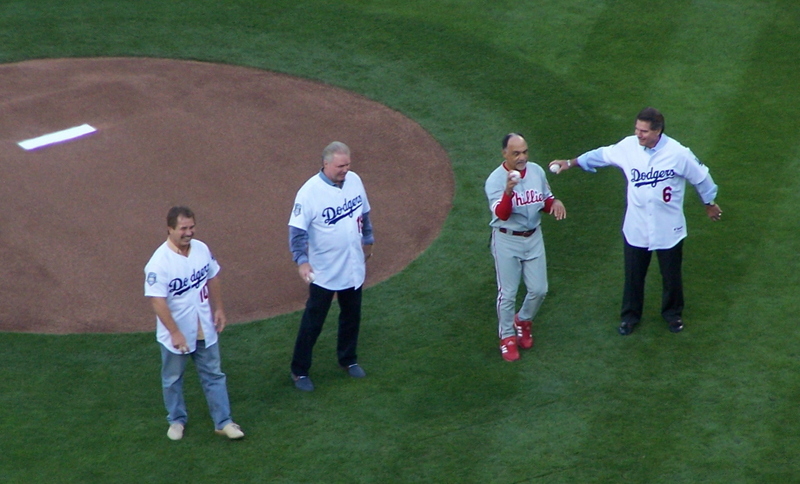 The four star infielders from the Dodgers for nearly a decade in the 70s and early 80s came out for the first pitch. How awesome is that? We had Ron Cey at third, Bill Russell at shortstop, Davey Lopes at second, and Steve Garvey at first. 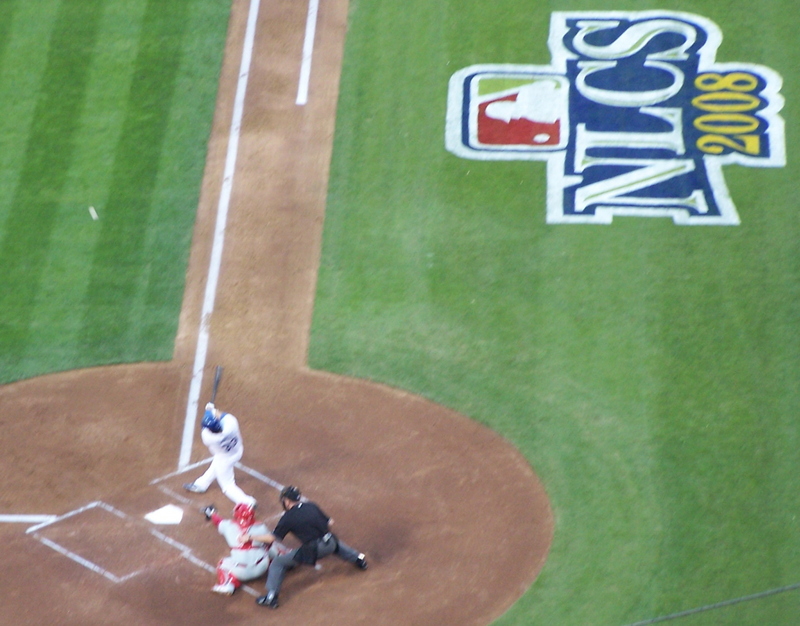 Catching the first pitches from the legendary infielders were the current starting infielders for the NLCS: Casey Blake at third, Rafael Furcal at short, Blake DeWitt at second, and Nomar Garciaparra at first. What’s funny is that I’ve met three of the four legends this season and have all of their autographs in the same book! (I still haven’t met Davey Lopes yet) Fun times! After all of that, the game finally started and so did the Dodgers’ offense. Right away, the Dodgers put up a run with Manny Ramirez driving in Furcal, followed by an RBI single by Casey Blake, and then a huge three-run triple from Blake DeWitt to put the Dodgers ahead 5-0 in the first. Talk about a quick start! So with the moon slowly rising up and the sun slowly setting, it was getting a little testy when Russell Martin nearly got hit by a pitch in the second inning, after he already got hit by a pitch in the first frame. He didn’t appreciate that inside pitch in the second, so we knew he would get even later. In the top of the third inning, Shane Victorino came up to the plate, and he got an inside pitch that HE didn’t appreciate. At this point, both benches were warned. Shane and Russell were exchanging some words with each other, and then Shane and Hiroki Kuroda got into it a little bit. Shortly after that, Victorino slammed a 1-1 pitch towards first base. 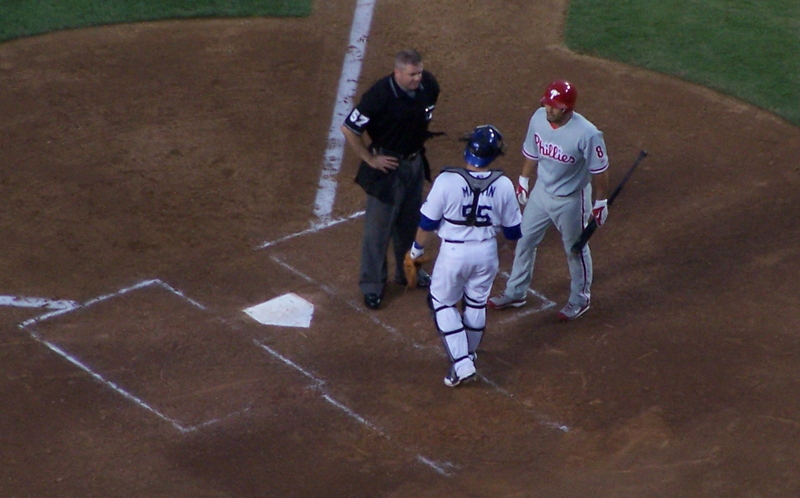 While Garciaparra easily got the force out at first, Kuroda went over to cover first base… and right after the play, Kuroda and Victorino crossed paths… and then it began. They exchanged pleasantries, got into each other’s faces, and then right before any fists went flying, or any leg kicking occured, the benches began to clear. First, the players on the field came to their team’s defense. 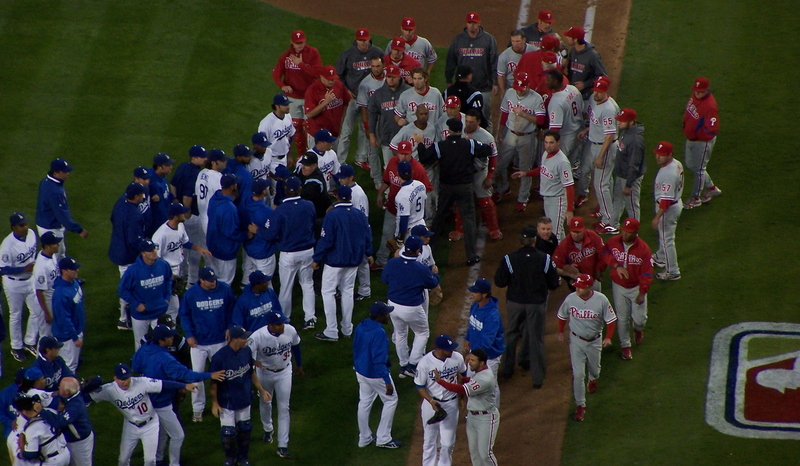 Then the players from the dugout came out and tried to make peace, but that wasn’t going to work. So then, finally, both bullpens emptied and the pitchers also charged down the field. Players had to be restrained to stop the pushing and shoving. No punches were thrown, but it looked like it was about to happen if people didn’t get in the middle of things. 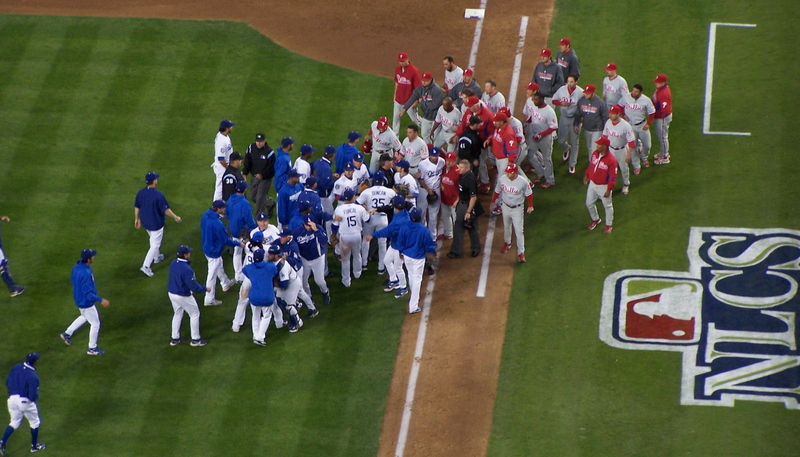 Also, the umpires did a great job of breaking up the fracas pretty quickly before it escalated. Of course, there were now six umpires instead of the usual four. At the time, this needed to happen. The Dodgers needed to show that they had a little fight in them, and they weren’t going to back down easily. After that whole scene happened, Hiroki Kuroda really got in a groove and got Phillies retired left and right! He put on a masterful pitching performance that evening and deserved the standing ovation he got when he was finally pulled late in the game. Those final three innings were fun to watch because we knew that the Dodgers had this game. Finally, the final out was recorded and Angel Berroa caught the final ball of the game. Dodgers win! Since I didn’t have tickets for the other two games of the NLCS (and was hoping the Dodgers would pull off the NLCS victory so I could go to the World Series), I had a feeling that this may be my last time at Chavez Ravine for a Dodger game, so I decided to take a bunch of pictures down in the loge level, and finally of that famous club level entrance. It looked pretty nice that night! After the game, my friend was really in a celebratory mood since the Dodgers won. Even though I told him it was only one game, he still wanted to celebrate and I ran with it. So I finally gave him the idea to head out to Canter’s restaurant on Fairfax because I wanted some good dessert. When we got there, I quickly noticed a mural of one of my favorite all-time Dodgers, Sandy Koufax. I said at the end of the night, I would get a picture with the mural. When we got inside, that’s when I saw the poster that said “Canter’s Celebrates 60 Years on Fairfax.” On Tuesday, they would be offering 60-cent meals of corned beef sandwiches, and other little goodies! I knew I had to go back on Tuesday. After having a delicious Chocolate Napoleon dessert, I decided to have my friend take the picture outside with Sandy Koufax. Pretty nice way to end the evening, I thought. It was quite the game, and a great memory etched in my mind. With that, I bid you all adieu, and I will post again soon! Wow… that was lame, I’ll admit. But it is definitely nervous time. I’m sitting here the night before the biggest series for the Dodgers in two decades, and I’m like most other loyal Dodger fans. I get very superstitious. I grew out my playoff beard, and have not even shaved my playoff goatee since the regular season ended ten days ago. Fun times! Meanwhile, I’m looking at the matchups, and I think this is a very even matchup that could easily go six or seven games. Will the Dodgers power pitching snuff out the potent offensive firepower of the Phillies? What about the Phillies pitching? So many questions to be answered all in the matter of a week. Which team will make the World Series? My prediction: Dodgers in SIX. 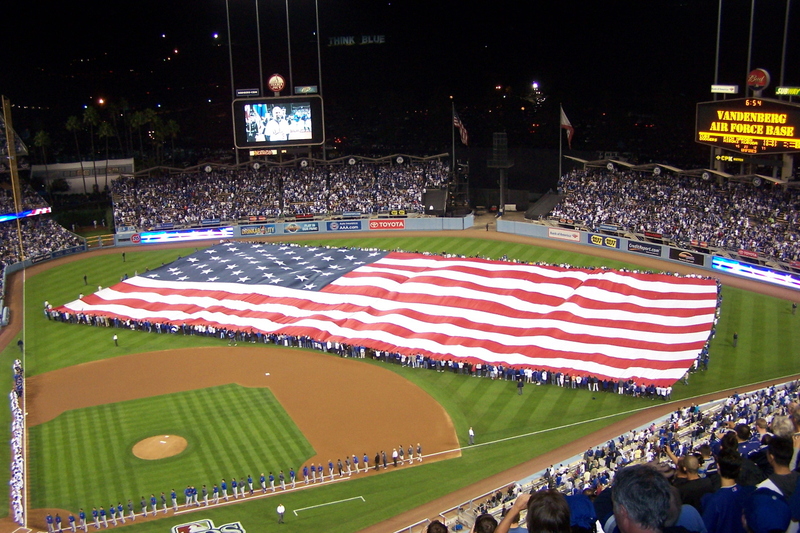 To end this short blog, I love the postseason at Dodger Stadium. The grass is a little greener, and painted on with an always-marvelous logo signifying which series is being played. For the past two decades, the only thing we’ve seen painted on the grass during the postseason has been for a division series. How exciting will it be to see “NLCS 2008” painted across from the dugouts? Also, I love how dressed up the awnings are for the postseason. 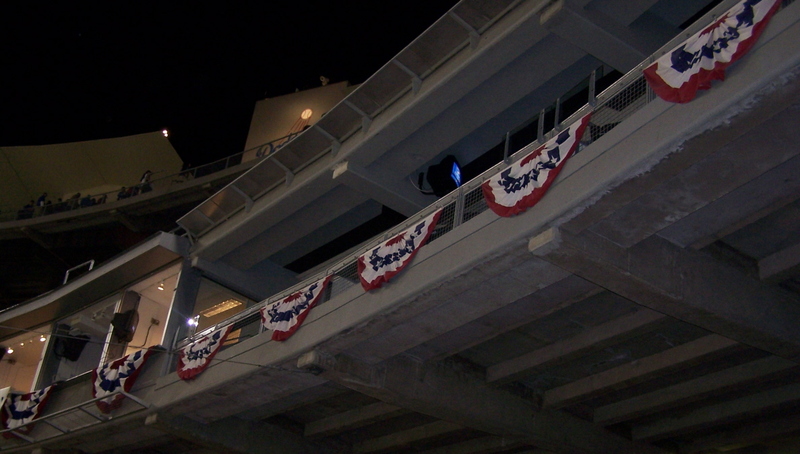 They are always adorned in those cool red, white, and blue banners that make the stadium look so… majestic. Beautiful, isn’t it? I’m off for the night. Feel free to comment away, and let’s go Dodgers! At least get a split in Philly! Wow, my voice is pretty much gone at the current moment, and I think I may need to rest all day tomorrow to recover… but it was all worth it. In three very exciting games, the Dodgers completed an improbable sweep over the cursed Chicago Cubs, winning game three, 3-1. 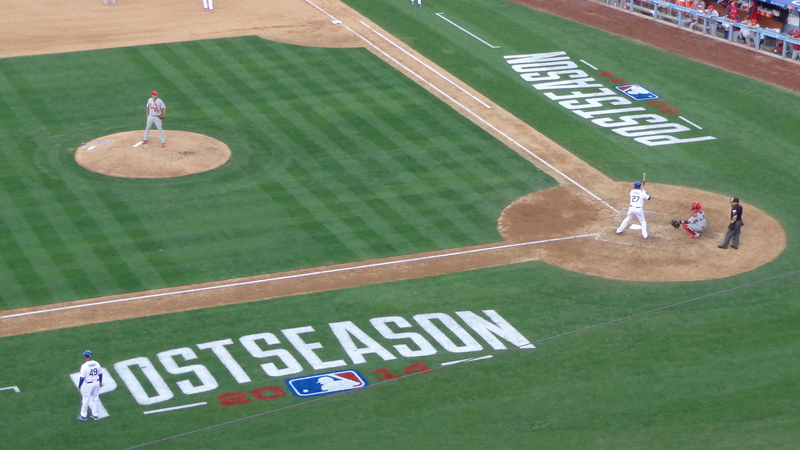 This NLDS has been a thrilling one, and if you were there for that game…. you were among the lucky ones! As you may have read from the previous post, the day started off with me meeting former Dodger, Bill Russell, and him being very excited that the Dodgers were about to sweep the Cubs. It was an omen… a sign, if you will. That early meeting in the morning was like a foreshadowing of just how great of a day it was going to be. After taking a short and well-deserved nap, I had to leave the house early so I could visit my cousin, who was having his going-away party. The reason he was having a going-away party is because he’s off for military service. He’s in the Marines…. and he will be in Camp Pendleton for a short stint before… being shipped… overseas. Yeah. =/ Please wish him well. This picture I took before the game is for him. Right after that, I headed off for the game. After darting my way around the packed freeways through the surface streets and taking shortcuts, I got slammed right as I was making my way through the gates. The way I look at it, if I had stayed on the freeway, I may have gotten to the stadium at 6:50pm, instead of around 6pm. Next time, I’m not taking any chances and getting there MUCH earlier. 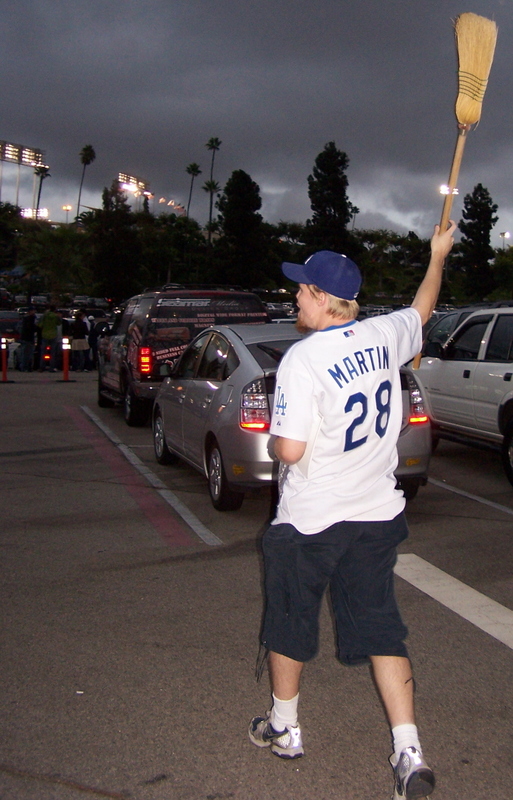 So we get to the stadium, and my buddy, Matthew, brought out his broom and waved it around like crazy before we headed to the stadium. We got in there with rally towels, got settled in, and saw an amazing introduction with the huge flag that you see above. Simply incredible. I know that Dodger fans get a lot of crap about arriving late and leaving early. When I walked inside the stadium before the game, our section was almost full already! Before the game even started, there were already about 50,000 fans in the stadium watching the pre-game festivities. These are the true fans. The passionate fans. The fans that will always be behind their Dodgers through thick and thin. Through the victories and heartbreaks (notice that heartbreaks is underlined), they showed up. Throughout the night, we had some drizzle here and there, but nothing too significant. But when the Dodgers took an early 2-0 lead thanks to our awesome offense, the fans didn’t seem to care. By the way, I’d like to send a thank you note to Jim Reynolds for giving the Dodgers that close call at third base when Russell Martin slid into third while trying to avoid the tag. On the replays, it looked like it was a bang-bang play, but when I got home and looked at that play even closer… Martin was out by just an eyelash. But at full-speed, it looked like Martin was safe, and that call really could have gone either way. It’s not as obvious as the play from the Rays/White Sox game earlier this week, or the 1985 World Series. But let me say this one more time. Those two runs seemed to be all we needed because we have awesome starting pitching. I’ve been saying this all season, but I love seeing Hiroki Kuroda starting at home because at any given home game, he can pitch a shutout. Last night, he had pretty much everything working for him. With every pitch, the crowd cheered, and with every strikeout, there was a definite roar across our section. Once it got into the fourth inning, the crowd could see Kuroda really settling down, and every Dodger fan there was behind him 100% of the way. At the end of each inning, when Hiroki had a two-strike count, everybody was standing up hoping for a strikeout, and he got it three innings in a row… all of them swinging! I’ve never heard the crowd so pumped up in all my years at Dodger Stadium. It was amazing. That’s when I started counting down the number of outs for the Dodgers to advance to the NLCS. Eight. Huge ovation for Kurdoa. Seven. Six. With a three run lead, and Wade and Broxton closing the game out, there were at least two people that left the game early. The two Cubs fans that sat next to us during the game had enough, and one of them had that same sad look when they lost the NLCS in 2003, and the NLDS last year. Even though I was a little happy to see them leave, I couldn’t help but feel a bit sympathetic towards those fans. They haven’t seen a World Series title in over a century and counting. I felt for them. The countdown was back on. Five. Four. Run scored… crowd gets a little tense. Broxton enters for Wade. Three outs to go! The excitement level is rising very quickly throughout the stadium as the Dodgers are that close to clinching their first NLCS appearance in two decades. The Dodgers get out of the 8th inning very quickly, and the countdown is on! Ryan Theriot up to bat. He quickly gets the count against him… he strikes out swinging. Two outs to go. Now it’s Kosuke Fukudome’s turn to try and turn this thing around. He fouls one off…. and then he grounds out to Furcal. Oh man, only one out away! The place is going berzerk! Alfonso Soriano is the Cubs’ last hope. He swings and misses for strike one. 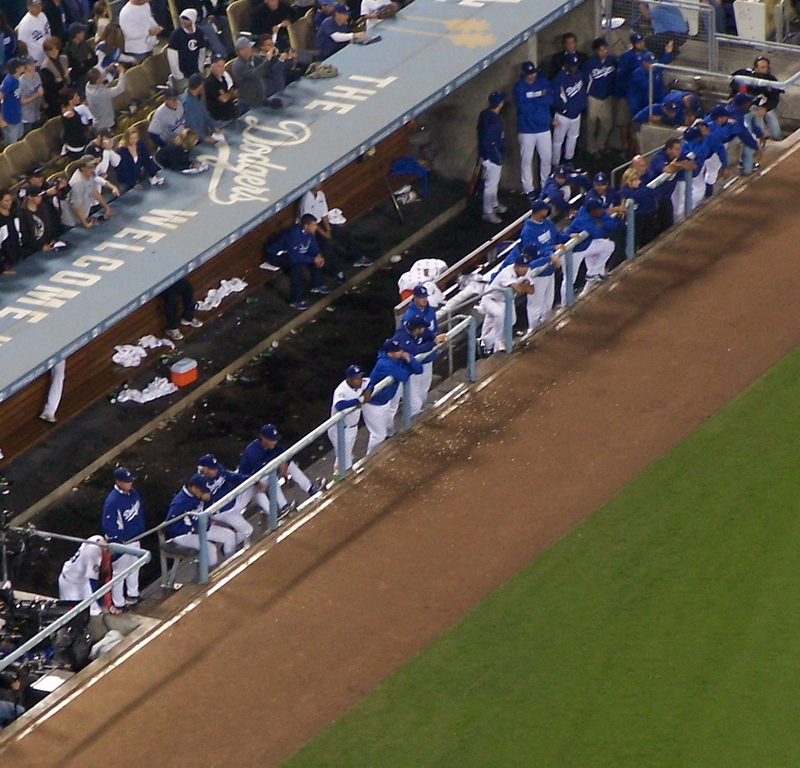 The dugout is looking on in anticipation. Almost everybody is on that front step! Swing and a miss! Another strike! The Dodgers are now one strike away! Everybody is on their feet waving their towels. Almost everybody. I wasn’t waving a towel…. I was taking this picture. STRIKE THREE! The Dodgers sweep the Chicago Cubs! The celebration is on! I will admit this right now. I shed a couple tears. I could hardly contain myself. Imagine if they make it to the World Series? If they win the whole thing, I will probably lose it. I laughed, I jumped for joy. I high-fived everyone around me. Heck, I even hugged a few people. We were all united as a legion of Dodger fans. It was an amazing feeling. 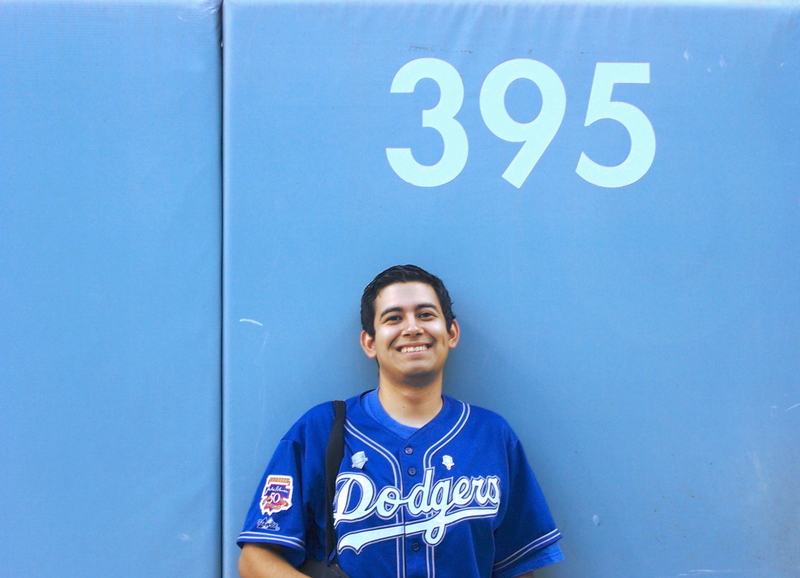 The last time my Dodgers made it this far was twenty years ago. Even though it’s been over a century since the Cubs won it all, 20 years is still a long time! After watching some of the celebration, I was pretty adamant in my wanting to get a closer look of the celebration before all of the players came out from their locker room. We raced our way down the stairs from the top deck, to the reserve level, and finally arriving at the loge level since the ushers wouldn’t let us go down any further. That’s fine, I was totally okay with that. 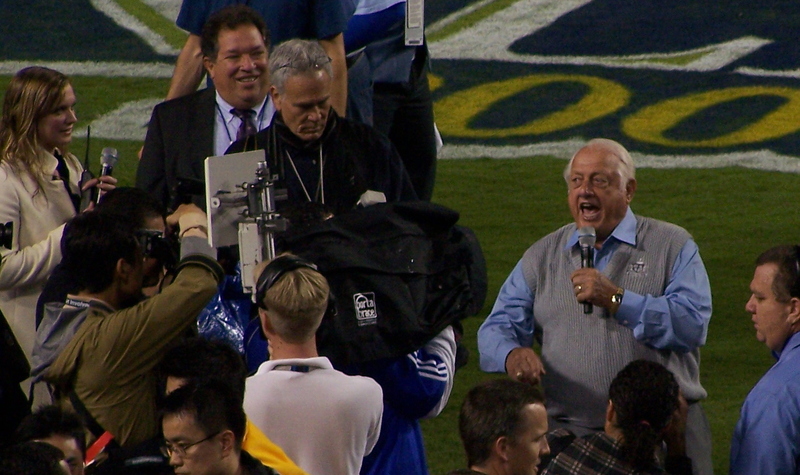 Right when we got there, several players came out, and we heard a couple speeches from Joe Torre, and one from the legendary Tommy Lasorda. Overall, it was an amazing day that I will never forget. *chuckles* …and to think, it all started when I met Bill Russell earlier that day. I told you it was an omen! Once again, much congratulations to your division series winners, the Los Angeles Dodgers.